Brandy Borne and her dramatically ditzy mother, Vivian, are stars of the new reality show, Antiques Sleuths. The season opens in a perfect location--a quaint old house echoing with the unsolved whispers of a 60-year-old axe murder. But when the show's producer meets a similarly grisly end, Brandy and Mother must chop around for clues, axe the right questions, and get the edge on a murderer's mysterious motives. Otherwise our sharp-witted sleuths may face cancellation--on the cutting room floor! 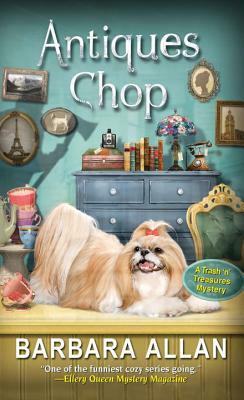 Praise for Barbara Allan and the Trash 'n' Treasures Mystery Series. . .